Let me back up a little bit first. 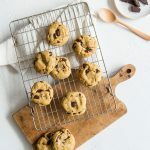 A few months back I was over on Claire’s site and she was sharing the exciting news that she had become a member of the Secret Recipe Club. It reminded me that I had applied for a spot at one point so I chased it up, and before I knew it I had a group! 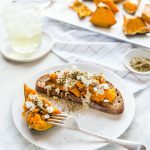 The way it works is that each month you are assigned a blog in your group, you make a recipe from your assigned site, and then everyone in the group posts on the same day. What a great way to discover other blogs you would never come across otherwise! Well my first assignment was Sarah’s blog, Fantastical Sharing of Recipes and I couldn’t wait to get started. I began hunting around and while dessert is always tempting I knew that my insanely decadent SABH post was going up only a few days earlier so I needed another option. For starters I replaced about half the flour with whole wheat. Then I changed out the butter and milk for coconut oil and almond milk to make it dairy free, and replaced the sugar with rice syrup. I also upped the orange in the filling and added a big hit of ginger just because. Yes, yes, a thousand times yes. The recipe makes a double batch of dough so before I knew it we had a braided loaf and buns, everybody wins. Of course now all I can think about is all the other things I can fill this bread with… Fruit? Chocolate? Curd? Something else? What would do first and what is your favourite Hot Cross Bun flavour combo? My print plugin is acting funny so we’re back to standard layouts, will get it fixed soon! Adapted from Fantastical Sharing of Recipes for the Secret Recipe Club. 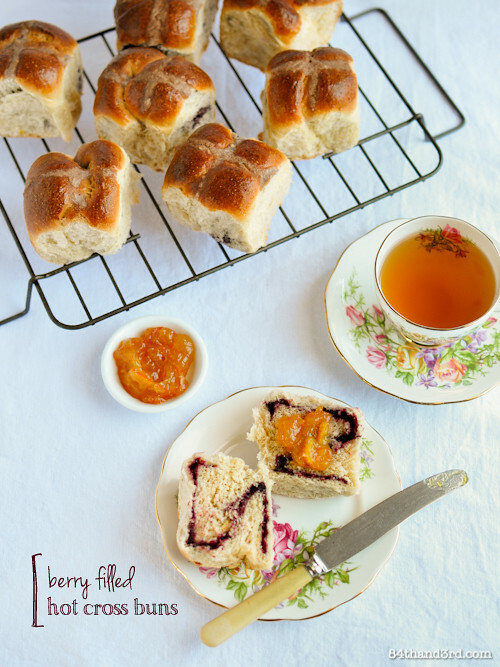 A perfect sweet breakfast bread filled with luscious berries and twisted into Hot Cross Buns – or anything else you can think of! Make Berry Filling, allow to cool as you prepare dough. Heat almond milk, orange juice, and coconut oil and rice syrup in a medium sauce pan until just warm*, whisk to combine well. In a large bowl, combine 2 c white flour flour and yeast. Pour in tepid milk mixture and beat for 2 mins with a large wooden spoon. Add eggs, spices, salt and 1 c whole wheat flour. Beat for another 2 mins, call in reinforcements if your arm feels like it will drop off..
Stir in remaining 1 c white flour and 1 cup whole wheat flour until a soft dough is formed. Scrape out onto a lightly floured benchtop, invert bowl over dough and walk away for 5 mins. Using the remaining 1/2 c whole wheat flour as necessary, knead dough for 5 mins. It will be sticky, a dough scraper is a great help to lift and flip, resist the urge to add too much flour as you want a tacky dough*. Invert bowl over dough and walk away for 2 mins. Knead a further 5 mins until you have a smooth but still tacky dough. Pour a splash of oil in the bottom of your bowl – no need to wash it first – and turn dough to coat. Cover with a tea towel and leave to rest and rise in a warm spot for 30 mins. While you cleanup the mess you’ve made in your kitchen, have a think about what you want to create. The instructions for Filled Hot Cross Buns and a Breakfast Braid are below but you could do anything you want with the dough… I see these showing up as Berry Swirl Cinnamon Rolls at some point… anyway, back to the recipe. Line base and two sides of two 8 inch/ 20 cm square cake pans with baking paper. Divide dough in half. Divide each half into three and three again to make 18 pieces – they will be about 80 g each if you are so inclined. Roll each piece into a sausage shape with your hands, then into about a 6×3 inch [15×7 cm] rectangle with a rolling pin. Place a spoonful of filling onto each rectangle then spread down the centre leaving space on all edges. Fold long edge over filling, fold up other long edge then pinch to seal long edge and ends. Set aside seam-side down while you roll and seal the rest. Twist into rolls, gently pinching ends together. Place 9 rolls, end-side down, in each pan, they should be just touching. Cover with a piece of oil sprayed baking paper and a tea towel and set in a warm place to rise for 1 hour. During the final 15 mins of the rising preheat the oven to 180C [350F]. Gently brush rolls with the egg yolk/milk mixture. Create a thick paste for the crosses* with 1/2 c white flour and 4-5 Tbsp water. Pipe on in three long stripes each way. Bake for 28-30 mins until golden brown. Let cool in pan 10 mins, run a knife along the two un-lined edges to release and turn out onto a rack to cool completely. Gently pull apart and serve with a cup of tea and Orange Marmalade, or butter, or any other topping you wish. Line two flat trays with baking paper. Divide dough in half. Divide each half into three pieces. Roll each piece into a sausage shape with your hands, then into about a 20×6 inch [50×15 cm] rectangle with a rolling pin – make sure the rectangle isn’t longer than the diagonal length of your tray! Place a couple spoonfuls of filling onto each rectangle then spread down the centre leaving space on all edges. Fold long edge a third of the way over to cover most of the filling, fold up other long edge then pinch to seal long edge and ends. Set aside seam-side down while you roll and seal the rest. Place three filled ropes diagonally on one of the lined trays. Braid, pinch ends together and tuck under. Repeat with other three ropes and tray. Cover loaves with a piece of oil sprayed baking paper and a tea towel and set in a warm place to rise for 1 hour. During the final 15 mins of the rising preheat the oven to 180C [350F]. Gently brush loaves with the egg yolk/milk mixture. Bake for 30-35 mins until golden brown, turning and swapping racks half-way through to ensure even baking. Let cool on pan 10 mins, move onto a rack to cool completely. Slice and serve with a cup of tea and Orange Marmalade, or butter, or any other topping you wish. Use leftovers to make French Toast, yes, I just went there. Milk mixture: this should not be hot, too hot and it will kill the yeast. ‘Baby bottle warm’ is a great guide, when in doubt room temp is best. Sticky dough: Tip: rub a bit of flour between your hands to get the dough off then knead it back in. Crosses: if you want to be really crafty bring a handful of frozen berries to a simmer with the water, press to extract juice and strain. Allow to cool then mix with the flour before piping on. No rolling pin? I used both wine bottles and pint glasses for years. A little bit sweet a little bit spicy and a little bit tart, this filling should have the consistency of thick jam once cool. Feel free to substitute with anything you choose. Place all ingredients except corn flour and extra water into a saucepan. Bring to a boil, reduce heat to medium and simmer 20 mins, stirring occasionally. Remove orange peel and ginger, smush any berries that have not broken down with a fork or the back of a spoon. Pour in cornflour and water mixture and simmer 4 mins, stirring constantly. Scrape into a dish to cool. Filling should be thick but still spreadable* like jam. Use to fill dough for Hot Cross Buns or a Breakfast Braid. If the filling forms a solid piece while it cools put it back in the pan with a splash of water and smush with a spoon adding more water as necessary. 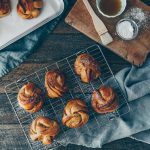 This definitely happened to me but the above recipe has been adjusted so it should be ok.
Loving the ingredients in these buns…especially the coconut oil! Great pics too! Oh man, do these ever look good! 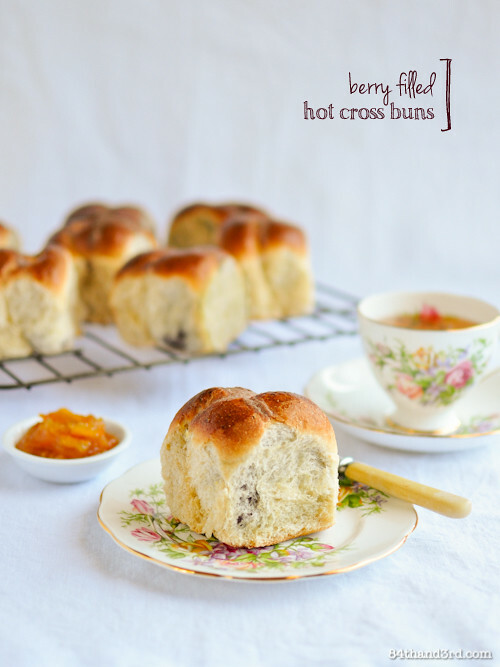 I’ve really been wanting to make/eat hot cross buns lately and the very twist sounds delicious! I’m impressed how you made them dairy free -next step for me is to make them gluten free as well! Happy reveal day! Wow, these came out beautiful! I’m impressed! They sound delicious too, great SRC pick! Wow, these all look delicious–could you deliver one to my house? Welcome to the SRC you will meet amazing bloggers. 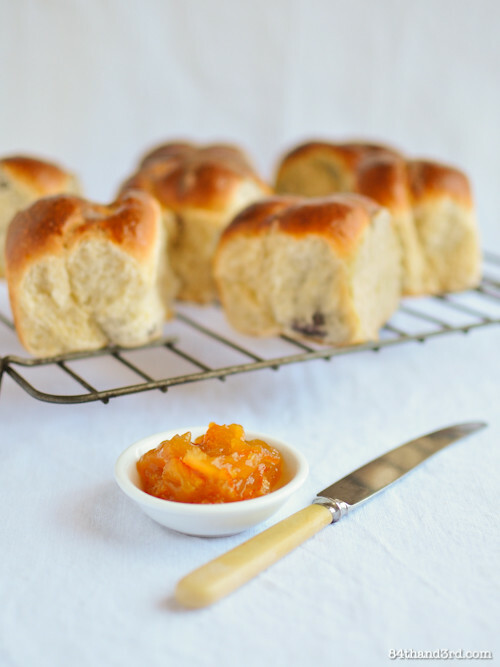 These hot cross buns look heavenly! I love the berry filling. Welcome to SRC! I am sure you will have a blast each month with the new assignments! I’ve been a member for over a year, and it’s amazing how it never gets old! you did a fantastic job with your first post, I look forward to next month! Wow! Not only do these sound amazing, but they look incredible! Great pick this month!! That berry filling is genius! Love the buns and the braid is a beauty! Wow–what lovely photos and a great post overall. The care and time you put into your post is quite apparent. Both the buns and braid look spectacularly good! These are so pretty…love the braiding. 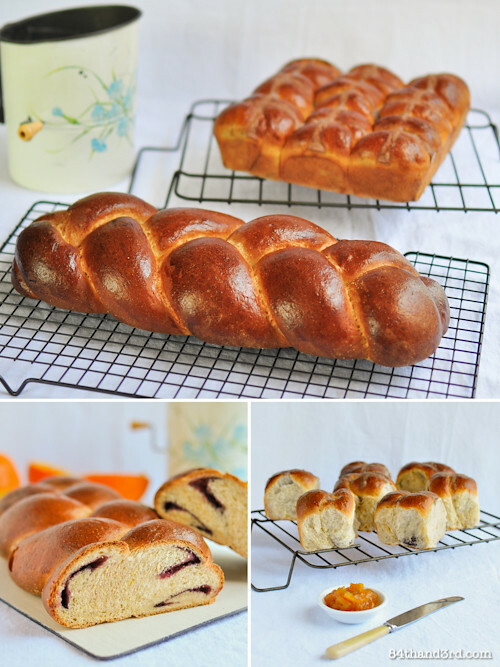 Whenever I braid bread it never looks good…great SRC pick! Yay that you’re in the club! I love that it has an ‘S’ of berry hiding inside… s for secret? Your swapping out ingredients has made me a bit more experimental with mine too and I’ve come up with some very interesting combos so far that taste just like the original naughtier versions. I think I would have to stuff these with chocolate, no wait raspberry and macadamia, hang on how about lime and coconut, or apple and cinnamon? haha the shape is not only arbitrary but different on each one ;D So glad I’ve inspired you to play with ingredients a bit! Ok so now I want to make every single one of your combo suggestions, I see many more batches of these in the future! I love the filling! It looks so tasty. I made a chocolate babka a few months ago, using a recipe from Gourmet Traveller, and it worked out really well and I was thinking of making it again for Easter. But I think chocolate is a little overdone at this time of year. I might make these buns instead! Chocolate Babka does sound good though ;D let me know if you give these a go! JJ these hot cross buns look gorgeous. Such a lovely alternative to the traditional, love the swirl of berry hiding inside them. 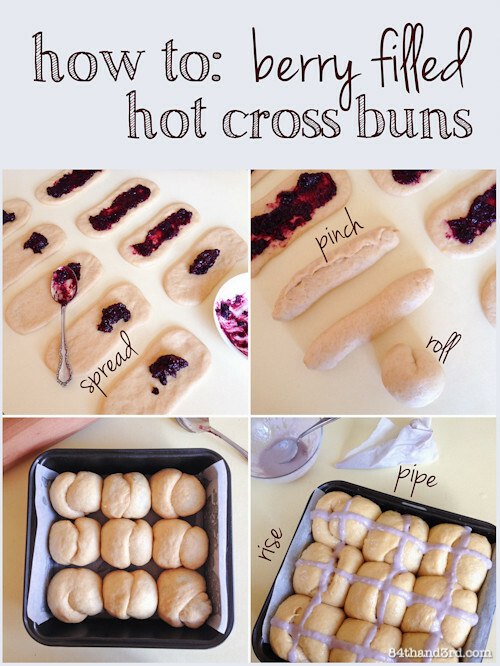 I love this alternative to standard hot cross buns. I really dislike the traditional varieties so these are going to get a try out in our kitchen. Your braiding is spectacular. I can never get mine to look so good. You just went and made my favourite carb at this time of the year EVEN BETTER – if that is possible. Also, I have major braid envy right now. I have never attempted one and I just know that if I ever did it would not be as neat as yours! haha I think after all these braid comments I might need to do a how to! Love the idea of stuffing HCB with berries, what an innovative way to add moisture and flavor. These look amazing! We’ve been sugar free since last year so very happy to find a recipe with all the substitutions already made. I’ve bookmarked these to try. Great pick for SRC! Gorgeous photos, these look and sound amazing! Funny how every year I tell myself i’m going to make hot cross buns for Easter and never do. Wow beautiful buns! And that berry, orange and ginger filling? Amazing! How divine! Happy Easter JJ! Che belle pane!! What beautiful and positively perfectly realized breads. I have never had a filled Hot Cross bun, a sad situation that must be remedied as soon as possible. Thank you for the wonderful idea, and for the beautifully written recipes. This is my first visit to your site. I came over from The Fearless Homemaker, and I am very glad I made the trip. Compliments and Happy Waster to you! Oh my gosh those are GORGEOUS!! Great SRC pick!! I love your pictures and recipes, they are mouth watering. 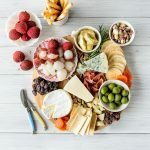 Would love for you to share them with us at foodieportal.com. We are new but at foodieportal.com we are not photography snobs, we are just foodies.